ELSAT BUC | Anacom, Inc.
AnaCom’s line of ELSAT® Block Up-Converters are highly integrated outdoor units, with full-featured monitor and controls, designed to give extremely reliable service in a wide range of environments. They are available in single or redundant configurations. Solid state power amplifier, up converters, M&C, and a universal power supply are all included in one enclosure. Connect power, IF cables, and one coax cable to the LNC and the unit is on-line. 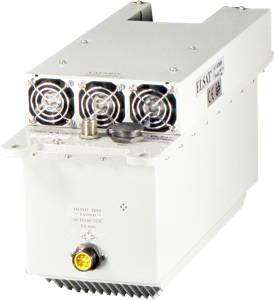 L-Band IF, up to 200 watts in one enclosure; higher powers with two enclosures. L-Band IF, up to 70 watts in one enclosure.